Review: Do you like action, adventure, or a combination of the two? Then Bushfire Rescue is the new book for you. 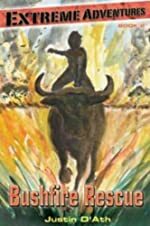 In this thrilling second part of the Extreme Adventures series, main character Sam Fox has to stop cattle rustlers, or cattle/cow thieves, from stealing his grand pappy’s prized bull. Justin D’Ath has made these books a 10- part series so far, with more to come. Some of the other children’s books Justin has written are Pool, The Quentaris Chronicles: The Skyflower, and Shaedow Master. All of these books show the fun – and danger—in life. Sam Fox had gone on vacation to his grandparent’s house in the country. As the story starts, we find Sam getting himself into a lot of trouble… throughout this book, actually, we find Sam in many desperate situations. First, we find him caught in the middle of a cattle snatching. Then Sam tries to go after them, and finds himself, and his little Palomino pony Susie, stuck right in the center of a rockslide (known as an avalanche in the story) and has the worst trouble getting out. Then, later, Sam Fox finds himself helplessly lost in the middle of the mountains, while surrounded by the worst bushfire he could imagine. And he’s stuck with a crazy old rodeo bull named Chainsaw (makes him sound crazy, too, doesn’t it?) to assist him. Sam has a lot on his mind, so I doubt he’ll be able to relax, don’t you think? Bushfire Rescue is a delightfully fun and thrilling book. Boys will enjoy the action, and most girls would enjoy the humor that intermingles in with the action. This is an easier book, probably meant for about 3rd-5th graders. Out of five stars, I give it 4 ½ stars because some parts the way the story was written could change, because the author didn’t place conventions appropriately. That had made me misinterpret what Justin tried to say, and confuse me later on. Overlooking that error, I find that these books are hard to put down. I am reading the whole series now and I hope there are more to follow. Review written by Willow (6th grade student). We would like to thank Kane Miller for providing a copy of Bushfire Rescue for this review. Have you read Bushfire Rescue? How would you rate it?